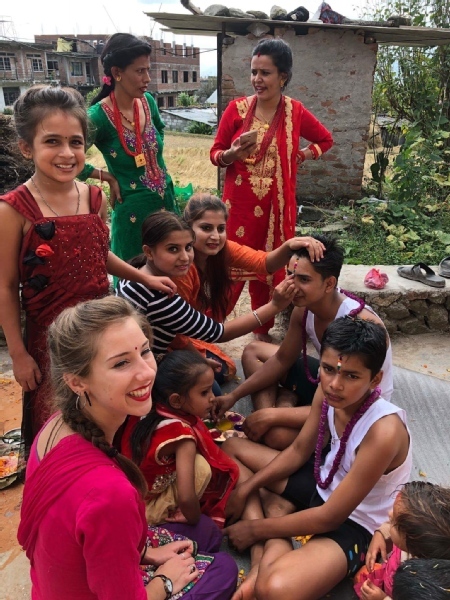 I volunteered for Ecoreach for one week in October, and although I happened to be there for the week of Tihar, and didn't actually end up doing much volunteering because of the holiday, it was still one of the best weeks I've ever had whilst travelling! It was an incredible experience staying in Jhor Mahankal with the host family, who we incredibly welcoming. They were so accommodating that I spent most of Tihar feeling like a part of their family and did spend it with their family. I have genuinely learnt so much about the culture, through chatting to the family, meeting the neighbours, exploring the village and even learnt some Nepali. On the last day of my stay we did a transect walk and just from the one day I already felt I had learnt a lot about the location and distribution of resources, features, landscape, and major land uses in Khatmandu Valley. He was very efficient and really knows his stuff. So if you are looking for the chance to volunteer on a great project, in a beautiful location, whilst experiencing a genuine cultural exchange, I would highly recommend doing it with Ecoreach foundation!